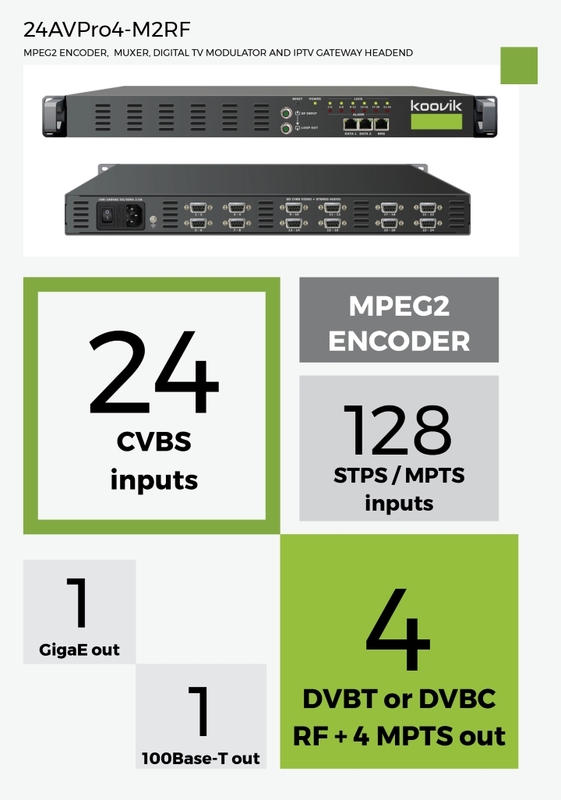 24 CVBS inputs MPEG2 ENCODER MUXER and RF DVB Modulator. 4 x DVB-T, DVB-C or ATSC (choose appropriate option) and 4 x IP MPTS outputs. 3 images or texts OSD (if enabled, the same OSD appears on ALL video signals). IP 128 SPTS or MPTS. UDP/RTP. UNICAST or MULTICAST. BIT-RATE 0.5 Mbps to 8 Mbps. CBR. User selectable per each video input. OSD Up to 3 objects. Image (.png, .bmp, .gif, .jpg, .jpeg), QR code (url), or Text (select font, size, color and background). multiplexer PID filtering. PSI/SI editing and insertion. Option CA: 4 x Simulcrypt Encryption. IP MPTS 4 MPTS TS output (mirror of each RF MUX) on GE DATA 1 over UDP or RTP/RTSP. Unicast or Multicast. network 1xGigaE 1000Base-T (DATA 1), or 1x100Base-T (DATA 2) ports. Select apropriate port on Set-up. SET-UP Network Management Setup - NMS : Embedded web server (English). RJ45 Ethernet. included 1 x mains cable, 1 x ground cable, 12 x D-SUB to RCA cables for 24 A/V signals.